When I received a phone call from a representative for famed producer Jerry Bruckheimer to visit the remote mountains of New Mexico to see the filming set for the forthcoming Afghan war movie, 12 Strong: The True Declassified Story of the Horse Soldiers, I was prepared to be underwhelmed. The movie, which retells the remarkable story of a brotherhood forged between Afghan Uzbek horse warriors and an elite Special Forces A-Team in the mountains of Afghanistan, is a story I have professionally immersed myself in exploring and bringing to life for a decade and a half. My journey to uncover the hidden story of this special operations campaign—that united Green Berets with fierce Uzbek Mongols as a proxy fighting force to overthrow the entrenched Taliban regime—had consumed me and, on a couple of occasions, almost led to my death. I still shudder at the memory of being told not to jump down from the clay wall of a small mountain firing post used by the anti-Taliban rebels when one of my Uzbek friends warned me there were landmines planted directly where I was about to land. To put it mildly, after all I had been through to shed light on this covert campaign from the Uzbek perspective in articles, books, talks to the NSA, Army’s Information Operations and CIA’s Counter Terrorism Center etc, I was skeptical that Hollywood could capture the essence of this story of men from different worlds uniting to capture an ancient shrine. How could a movie studio based in California capture the immense, majestic beauty of Afghanistan’s soaring Hindu Kush Mountains, the almost primordial beauty of her warring ancient Aryan, Persian, Mongol, and even Greco-Macedonian tribes, the glory of the ancient blue domes shrine of Mazar i Sharif (the crucible of Afghanistan) and the authentic facts behind the covert 2001 helicopter “infil” of 12 Green Berets and 8 CIA operatives into the Afghan “Graveyard of Empires?” As an author of seven books on warfare and ethnicity in an around Afghanistan and professor of Islamic History, I should also state that my greatest fear was that the director and producer would relegate the country’s fascinating ethnic groups, who had so welcomed me on my five journeys across the region, to mere local backdrop in their efforts to lionize the American special forces. The incredibly brave Green Berets were of course worthy of all the attention focused on them (as much as their commander, a self effacing Kansan named Mark Nutsch who I am proud to call friend, disliked the focus on him and his team of ‘shadow warriors’). But I had grown tired of the ultra-patriotic “black” and “white” War on Terror genre of films that simplistically divided the world between good Americans and bad Muslims. With the notable exception of Lone Survivor, Hollywood movies dealing with warfare in the Islamic world completely dismissed the rich ethnic fabric or “human terrain” of societies that America has been fighting in since 2001. For movie producers, as for most Americans, the world was, and is simplistic and, binary. It is us versus them,…the Muslim “Others.” The nuanced fact that across the globe brave Muslim Kurdish Peshmerga warriors whom I have embedded with, Iraqi Special Forces, Pakistani/Afghan troops etc. whom I have had the pleasure of seeing in action are our greatest allies in the war on terrorists was lost in such movies as Act of Valor, American Sniper or Zero Dark Thirty. 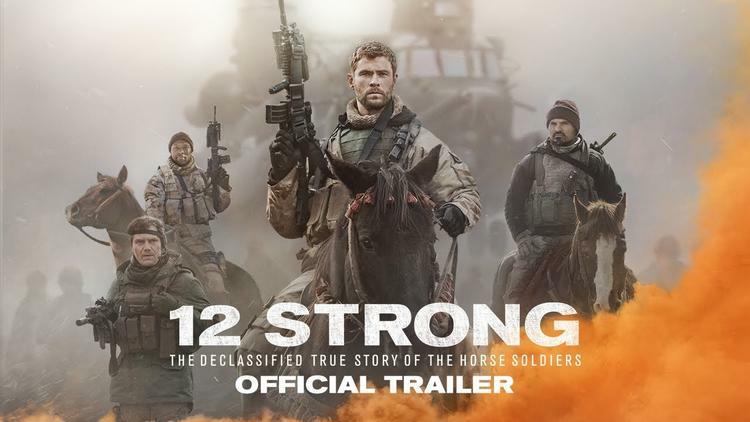 I am happy to report that 12 Strong avoids the trap of simplistically dividing the Afghan theater of operations into a one dimensional, bipolar reality, with Afghans constructed as mere “bullet sponges” for brave Americans to kill. This feat was accomplished under the skilled direction of both its producer, Jerry Bruckheimer (who gave us Black Hawk Down) and a complete unknown, Danish director Nicolai Fuglsig. In the process of avoiding the pitfalls of Hollywoodisitic Manichaeism, the movie faithfully captures the complexity of the campaign in the mountain battlefields I know so well. 12 Strong completely avoids the black and white clichés of the war on terror genre and takes viewers on a multifaceted journey into an unusually complex realm that is nuanced in every sense. It is worthy of today’s sophisticated, discerning audiences that have made movies like I am Malala popular due to their exploration of Muslim lives in the region. In weaving a nuanced story that captures the spirit of both Khalid Hosseini’s poetic writings of Afghanistan in The Kite Runner and the intensity of Kathryn Bigelow’s Oscar-winning Iraqi pulse pounder Hurt Locker, 12 Strong brings to life a world dominated by one of the two main characters in the film, the legendary Uzbek Mongol warlord, General Abdul Rashid Dostum. It is Dostum (magnificently played by Iranian actor Navid Negahban) who puts his unexpected imprint on the Afghan war epic and brings it to life in real world “gray.” Negahban plays Omar Sharif to Chris Hemsworth’s powerful rendition of a modern day Peter O’ Toole’s Lawrence of Arabia. Hemsworth (famous for his rendition of Thor in the Avengers movies) intimately portrays Captain “Mitch Nelson” (based on the real Captain Mark Nutsch) head of the 12 man A-Team tasked with leveraging Dostum’s Uzbek warriors against the common Taliban foe. Just as the Arab chieftain Omar Sharif and British agent Peter O’ Toole played men from different worlds who had to overcome distrust in order to defeat the common Ottoman Turkish enemy, Negahban and Hemsworth spar, test one another, clash, and ultimately bond to become brothers. There is more tension in the movie version of their relationship than the story conveyed to me by Dostum and Mark Nutsch, but Hollywood is allowed some script freedom to build a compelling plot. The plot diverges from the reality I know from months spent traveling with Dostum and his commanders retracing the battlefields in other ways as well. In the movie, Dostum withdraws his troops from the campaign when he hears his ethnic Persian Tajik rival, Atta, has been given a Green Beret A Team of his own. This never happened. On the contrary, Dostum was so driven by the surprisingly successful campaign that he was personally leading that he agreed to Green Beret leader Colonel Mulholland’s decision to deploy an A Team to his Tajik rival. At the end of the movie, Dostum also executes his Taliban nemesis with a shot to the head, a fact not lost on the Uzbeks. At the premiere of the movie in Manhattan on January 16, I had the honor of having my friend, Dostum’s son Batur and a group of American Uzbeks led by Ambassador Ayoob Erfani by my side. When the fictional Dostum, who has lost his family to a notorious Taliban commander (in reality his wife was killed on accident) shot his nemesis, the audience filling the hall broke into their only applause during the movie. Batur Dostum was thrilled to say the least. In reality, Dostum captured Mullah Faisal, who was then transported to Guantanamo Bay by his American allies. Having been to Gitmo’s notorious prison to serve in the Military Tribunals, I suspect the fanatical Pashtun Mullah would have preferred death to life in the “Pearl of the Antilles. Having said that, I should, however, state that my own journey of appreciation for 12 Strong was long in coming and fraught with the same sort of distrust and tension that Dostum/Negahban and Nustch/Hemsworth had to overcome. It was Bruckheimer’s representative who began the journey of breaking down the barriers of my own misgivings in February 2017 as we drove south from Albuquerque to the remote mountainside that had been chosen as the film set for much of the movie. My journey of growing trust began as we crossed a windswept plain with barren brown mountains surrounding us on both sides. As we traversed the desolate landscape, I felt an overwhelming sense of de’ ja vu. The brown, stark vista was eerily reminiscent of the Shomali Plain north of Kabul and I felt as if I had been transported to that heavily mined war zone. When I mentioned this to Bruckheimer’s rep, he told me that the director, the untried Dane, Nicolai Fuglsig, had obsessed with finding his “Afghanistan.” After months of frustration, he had settled on this American iteration of the Hindu Kush. Producer Molly Smith later told me that he had travelled far and wide, reportedly as far as the Atlas Mountains of Morocco, studying terrain that matched footage and pictures from the Afghan mountaintop battlefields to find the perfect spot for his movie. As we arrived at the Afghanesque movie set and hiked up the steep mountainside, I grudgingly gave Nicolai a thumbs up. The fine, windblown talcum powder-like dirt that got in your mouth, hair and clothes, the barren landscape devoid of vegetation (I was later told there were shrubs that he had removed), and the rocky mountains soaring around us, felt exactly like the Afghanistan I knew. As black-clad Taliban actors walked towards me, I was taken back to my interviews with dozens of Taliban prisoners of war that I had been granted access to in Dostum’s grim fortress prison in his northern base in Sheberghan. Only these smiling Taliban extras posed for photos with me and welcomed me to the movie set with New Mexico drawls, instead of ranting about how America was “the Great Satan” and Dostum a “traitor to true Islam.” As the black turbaned American Talibs walked away, I nodded approvingly when I noticed they were armed with real Russian manufactured AK 47 assault rifles and RPG-7s (Rocket Propelled Grenades). But that was not the only bona fide Soviet weaponry I encountered on the movie set. As we hiked further up the windswept mountainside, I was shocked to see Soviet T-72 main battle tanks and BM-21 Grad multiple rocket launchers. When I asked where on earth this Soviet hardware had come from, Bruckheimer’s rep explained that they were captured equipment lent to Warner Brothers from nearby White Sands Army Base. Nothing irks me more than seeing fake military equipment in movies. I still wince every time I show the students in my Afghan history class the scene of Sylvester Stallone in the 1980s Afghanistan-based Rambo III (the ultimate white-man-saves-benighted-natives movie) shooting at a French Puma helicopter mocked up as a Soviet MiL-24 Hind attack helicopter. Another thumbs up for Fuglsig who also flew real MH 60 Black Hawks in his movie, instead of the outdated Vietnam Hueys that appear in so many other war movies. I had the pleasure of meeting Chief Warrant officer Alan Mack, who flew the helicopter “infil” mission to insert Captain Nutsch and Operational Detachment Alpha 595 into the Hindu Kush at night, and he informed me that the scenes in the movie depicting the SOAR (Special Operations Air Regiment) “Night-Stalkers” infiltration into the cloud covered heights of the Hindu Kush were harrowingly accurate. Negahban dismounted and approached me with open arms and wide smile. “Welcome to Afghanistan my friend!” he said as he guided me towards the mass of hundreds of movie extras and film crews operating camera cranes. Navid and I had become friends months earlier as part of his journey of immersion into his latest character. I had sent him copies of my book The Last Warlord. The Life and Legend of Dostum, the Afghan Warrior who led US Special Forces to Topple the Taliban Regime (see CIA’s review of the book here: https://www.cia.gov/library/center-for-the-study-of-intelligence/csi-publications/csi-studies/studies/vol-58-no-2/pdfs/Seeger-Review-Last%20Warlord-June2014.pdf ) These books were to be distributed to the script writer, Ted Talley (creator of Silence of the Lambs, etc), Jerry Bruckheimer, Nicolai Fugslig, Molly Smith, Chris Hemsworth, Michael Shannon, Trevante Rhodes, Michael Pena and other cast members playing Green Berets from the legendary A-team known as Operational Detachment Alpha 595, code name “Tiger 02.” I had also dispatched him hours of combat footage given to me by General Dostum and my own extensive collection of videotapes filmed during my two summers living with the Uzbek warlord in the shrine town of Mazar i Sharif. As we made our way though cast and crew, Navid introduced me to the gregarious Fahim Fazli (a brave former Afghan interpreter for the Marines in the Taliban-infested south who has written a book on his experiences titled Fahim Speaks) and British actor Laith Nakli (who recently excelled in the war films, The Wall and The Long Road Home). These fine actors played Dostum’s right and left commanders, Fakir and Lal. I had gotten to know both of Dostum’s trusted lieutenants well during my summers spent with the Uzbek tribal leader and I showed the actors photos of the men they were playing to perfect their costumes. Navid, who speaks the Afghan trans-ethnic language of Farsi-Persian-Dari, also introduced me to dozens of Afghans he had discovered and recruited in Albuquerque. As it transpired, the production crew had had the good fortune of being in close proximity to an Afghan refuge community in the New Mexico capital whose paramount leader endorsed the movie. The Afghans, led by the Sharifi family, were honored to assist the actor playing the Uzbek warlord who had for years terrorized their Taliban enemies. Etched on many of their faces was the memory of having lived through the collapse of the monarchy, a genocidal Soviet invasion, bloody civil war, Taliban slaughter and brutality, and now savage insurgency. Here in America they had found panagah, sanctuary, and they were profoundly grateful. Navid, (whose grandmother was an Afghan) had grown up near Iran’s Afghan border getting to know Afghan refugees from the 1980s Soviet invasion and was the perfect bridge to these noble Afghans whose story and rich culture he knew so well. Every day when they arrived with a great sense of dignity on the movie set, the Afghan extras would kiss the back of their khan’s (leader) hand in a sign of respect and then go on to give the movie an authentic Afghan aspect. No American stand-in could duplicate the uniquely primordial Afghan physiognogmy of the sort captured in the famous National Geographic cover photo of the Afghan girl with haunted green eyes. I was thrilled to see the descendants of Genghis Khan, Alexander the Great, the Persian Emperor Darius, Ahmed Shan Durrani, and Attila the Hun authenticating the movie. Navid also conspired with me to bring the CIA on board. When I heard that the Agency had not been included in the movie plot, I showed Jerry Bruckheimer a photo in my book of the CIA legend “JR” (with eyes blacked out for security purposes) who happened to be my boss at the CIA’s Counter Terrorism Center. He had been one of the Agency’s eight forward scouts to be inserted by Black Hawk helicopter into the mountains of Afghanistan to pave the way for the Green Berets in October 2001. I let Jerry know that JR, who had recently retired after a remarkable career in Afghanistan going back to the Soviet invasion, lived in a remote canyon south of the set. JR, like the ever-gracious Mark Nutsch and another Green Beret horse soldier, Colonel Justin Sapp, had done me the honor of speaking to my enthralled students in my Afghan class and was also a friend. I offered to connect him to the set and Jerry was thrilled. Thus was born the mission that led Navid and Nicolai on a journey deep into the New Mexico badlands to meet a reclusive field operative who shared his accounts with the cast and director to help bring to life the CIA case officer in the movie. In my opinion, the CIA’s leading role in the campaign could have been further developed and there is still room for a journey into that remarkable war being fought at great cost in the shadows with deadly Reaper drones, night raids, and spy networks to this very day. Overall, I was needless to say I was satisfied with the Afghan facet of the movie that was in Navid’s energetic and capable hands. But what of the other half of this epic tale, the Green Berets? The Navy SEALs have gotten all the glory in the war-on-terror movies thus far, and this was the Green Berets’ first cinematic debut since John Wayne’s 1968 movie The Green Berets. I was close to the Green Beret community due to the good offices of one Colonel Andy Anderson, a southern gentleman warrior who was the heart and soul of this elite community, and had recently attended a ceremony in the shadow of the new World Trade Center with him. This solemn ceremony had been to dedicate a massive horse-mounted bronze solider statue honoring the Special Forces of Afghanistan. There, I met with three star General John Mulholland (played by a much smaller William Fitchner), who commanded the Green Berets Afghan helicopter insertions of 2001, and other members of the legendary Green Berets who fought in that theater of operations (I had also arranged to have Dostum’s son Batur attend the event, along with Mark Nutsch). Afterwards, I had the chance to talk to Hemsworth and found him to be hungry for any and all information on Afghan tribes and their culture in order to infuse his character with as much authenticity as possible. I was as impressed by his genuine desire to learn local terms and cultural customs as I was by the profound sense of humility he displayed in portraying my friend, the very real Captain Mark Nutsch. In an eerie way, his hunger for Afghan intel and total humility seemed to be channeling the same qualities as I had seen in Mark. Hemsworth explained on this occasion, and at a later in Hollywood, just what a profound responsibility it was playing a US military legend who was still alive (as apposed to say George C. Scott playing the dead General Patton). I sensed that the pressure on him was immense as he knew Mark Nutsch would later be watching the movie. Meanwhile, standing silently by himself watching the whole production was the legendary Jerry Bruckheimer, the driving force behind the movie who had spent a decade and a half tenaciously fighting to bring this homage to American Special Forces to the big screen. He has been as inspired by the story as I was, only his medium was not the printed word, but the silver screen. It was Bruckheimer who had bought the rights to the magical book by writer Doug Stanton titled The Horse Soldiers which provided a retrospective overview of the exploits of all fourteen Green Berets teams operating in the Afghan theatre. I was a huge admirer of Stanton for daring to master so many diverse A-teams (whereas I had barely been able to tell the story of ODA 595 “Tiger 02” and its mission with Dostum) and was thrilled to hear Bruckheimer had optioned the rights to his magnificent bird’s eye overview of the 2001 war. But I was intrigued by Jerry’s choice of the unknown director Nicolai Fuglsig whose awards had come not from movie making, but from his groundbreaking commercials. I discussed his choice of Nicolai with Jerry on the set and later in Hollywood and was surprised by his loyalty to his unproven movie director. Jerry explained to me that it was Nicolai’s shared passion and vision for the project that had driven him to hire his director and defend him from subsequent detractors. After our discussion, I was eager to meet the young director who had so inspired the great Bruckheimer. I found Nicolai in a small mobile production vehicle furiously directing a combat scene that involved massive bombs exploding in the valley below us. I can assure you there were no fake special effect bombs on the set, these were the real things, and the explosions were massive. As the rumble of an explosion reverberated up the valley towards us, Nicolai called a cut to the scene and welcomed me to his vehicle. I was beyond gratified when he explained to me that my humble book on the covert campaign had provided him with “half of the story” he was telling through the lenses of his camera. Nicolai then excitedly showed me the movie trailer ad he had just received minutes before. The trailer was simply epic in its capture of hundreds of turbaned chapan-clad turbaned horseman charging through bomb smoke to attack the Taliban enemy filmed through the lenses of a drone flying above. It closely resembled the footage Dostum had given me that was shot by a cameramen in the months before America intervened in his lonely war on the fanatics. The most impactful scene on the trailer, however, was of a gruff and grizzled Negahban-Dostum sitting in a clay-walled mountain house bluntly asking the untried Hemsworth-Nutsch if he had killed before. Hemsworth responded simply by saying “take me to the frontlines…and I will kill Taliban.” I was beyond impressed and, on this occasion, and subsequently in Hollywood, I probed Nicolai on his own journey into breathing life into this mountain campaign fought at 7,000 feet in the unforgiving Hindu Kush Mountains. Nicolai sounded almost like an anthropological-military historian as he talked of his deep passion for Afghanistan, her people and the Green Berets. While he had never been to that epic Central Asian nation, I sensed it had enraptured him just as it had me. Nicolai explained to me that he had spent considerable time filming in Kosovo during that war and, as someone who had also been in Kosovo, I began to gain respect for the Dane and his understanding of the horrors of warfare. But it was not until I got to Hollywood and Molly Smith explained to me that Nicolai had spent years painstakingly a massive Afghan pictorial “Bible” that I realized just how dead on my assessment was that Nicolai was a military-anthropological historian at heart. Nicolai’s vision was certainly admirable, but would 12 Strong achieve the noble object that he, Navid, Jerry, Chris, Molly and all those involved in the production were so passionately striving for? For eleven months I waited with a muted, cautious sense of hope for the pre screening of the movie in Manhattan on January 6th. Having being so invested in the real story, it was with an almost visceral sense of trepidation that I entered the small screening studio at Warner Brothers to watch the cinema version of the very story of a warlord’s unlikely friendship with a Kansan Green Beret rodeo rider. When it was over, I walked in silence outside and called up my Uzbek friend Ambassador Ayoob Erfani and spoke to Dostum’s personal envoy in a somber voice, realizing he would convey the news to the man who was now Vice President of Afghanistan and to millions of Uzbeks who were nervously waiting to see how they and their “baba” (father) had been treated by the American movie. My response was unequivocal “Nicolai outdid himself and more than fulfilled the trust placed in him by Jerry Bruckheimer to accurately bring their story to life. Vice President Dostum will be satisfied with the way the 12 Jasurs (the ‘braves’ or ‘strong ones’ as he always referred to them to me) were portrayed. All of Dostum’s brothers were portrayed with honor, my friend. Just as Dostum was.” I could hear a palpable sigh of relief on the other end of the phone as Ayoob responded. “Thank you Brian, I will convey the wonderful news to General Dostum. He will share it with all Afghans.” It took me a while to collect my swirling thoughts and emotions after the phone call with Ayoob. It was only after several days that I could weigh in on a movie that had taken a few over-the-top Hollywood turns and plot twists that I had not anticipated. But I can now say that, having watched this historical epicthrough the critical lenses of a professor of Central Asian Islamic History with Afghan “boots on the ground experience,” I would rate 12 Strong highly for its faithful depiction of the essence of the 2001 mountain campaign as I have chronicled it. In its quest for authenticity, 12 Strong is the most accurate portrayal of America’s warfare in the Islamic world since the dark day of 9/11 propelled its fighting men and women across the world to fight in distant lands. From the historical perspective, it is a magnificent re-telling of a pivotal mountain campaign that changed the course of history. At the end, the movie does sensationalize the final horse charges and put Americans at the forefront of what was actually a charge led by Dostum’s number two, Commander Lal, but this inverse of the Green Beret’s policy of “putting a local face on campaigns” makes for good entertainment, and is forgivable. Thanks to Jerry Bruckheimer’s persistence in fighting for years to tell share this story and Nicolai Fuglsig’s masterful retelling of it, millions can finally relive a covert mountain battle fought by American shadow warriors and the horse-mounted Uzbek descendants of Genghis Khan to destroy the terrorists’ sanctuary in Afghanistan. The red carpet world premier for 12 Strong was held in Manhattan on January 16th. It was in many ways a tribute to the Green Beret “Jasur” Strong Ones of ODA 595, six of whom were honored in the audience when General Mulholland stood on stage with Jerry Bruckheimer and asked them to stand to a standing ovation. Their wives were also honored as the ‘real heroes’ to even greater applause. Having gotten to know the stalwart Amy Nutsch, who laughed good naturedly at Australian actress Elsa Pataky’s effort to capture what it means to be left alone to raise children (Amy was pregnant with her daughter Kaya when Mark went to war in September 2001) and run a household when your husband is across the world fighting terrorists in a distant terra incognita, I could not agree more. As I talked with one of ODA 595 team member, Vince Makaela, over sips of Horse Soldier whiskey that the team had produced for the after premiere gala event attended by stars like Matt Damon, he also laughed good naturedly at the movie and recalled “the Dostum I knew moved around striking from afar and jumping from hidden position to position, instead of charging straight into the enemy every time.” Makaela’s assessment rang true and took me back from the red carpet event attended by champagne-drinking glitterati, who could not imagine what it was like to be in the magnificent mountains of Afghanistan that had always called to me. I recalled Dostum pointing up to them and retelling a story similar to Makaela’s of the remarkable campaign with his loyal right and left commanders Lal and Fakir by his side. We moved around the mountains calling in strikes on the Taliban below in the Darya Suf and Balkh Valleys who had never seen such precision bombing before. When the bombs fell on our enemies, we cheered from the tops of the valley and I mocked the Taliban on my radio. I told them I had Azrael (the Death Angel) and laser rays. They were superstitious and believed me so they began to surrender in the hundreds. The dozens of Taliban prisoners of war I interviewed after the campaign, many suffering from PTSD, spoke of the terror they felt when the Americans suddenly appeared in their enemy’s ranks and began calling down laser and satellite-guided bombs on their positions–that were blocking Dostum from escaping the valleys–with devices known as SOFLAMs (Special Operations Forces Laser Acquisition Markers). And this is the essence of the campaign as Mark Nutsch explained it to me in interviews for my book. He broke his team up into two cells, Alpha and Bravo, to maximize his team’s potential as “force multipliers.” These two teams then traveled vast distances on horse back across unimaginably dangerous mountain terrain to flank the Taliban and call in “air artillery” from aircraft “stacked” above them. Michael Penna and Michael Shannon faithfully play the Alpha and Bravo team leaders who called down withering devastation as they “grasshoppered” around the mountains (in Dostum’s terms) and broke the spine of the numerically superior Taliban. When I told Michael Shannon that Dostum’s son Batur was in the crowd at the after premiere party, he was thrilled to meet him and thank his father for his role in the campaign he brilliantly depicted. As Batur, a humble version of his Taliban-slaughtering warlord father, posed for pictures with Michael Shannon, I felt this was the heart of the story. I truly enjoyed seeing my father as a hero. I hope it helps improve relations between the Afghan people and Americans and shows them who is fighting in their interests against the enemy we have in common. My dad left Kabul last year to personally led his troops for months in the north against the encroaching Taliban from the frontlines. He is still fighting with his men in the trenches. My father and I love the Americans and appreciate all their sacrifices and bravery for fighting this very enemy. For this I am grateful to the movie. It captures the Americans’ bravery We are on your side and Americans need to know this. We are your friends. Never were truer words spoken when referring to the campaign depicted in 12 Strong. As the impossibly large mounds of rice pilaf, lovingly prepared by Ayoob’s wife Jamila and daughters, Nilad, Nilufar and Susan were consumed by friends from places as diverse as Nutsch’s hometown of Alma, Kansas and Batur’s hometown of Sheberghan in the windswept plains of northern Afghanistan, I enjoyed the moment of friendship. It was this sort of bridging of languages, religions, and continents that gave me hope, not just for Afghanistan, but for Islam’s relations with the West. For sharing that message of friendship of the sort Batur spoke of with the world, I think Nicolai Fuglsig, Jerry Bruckheimer, Navid Negahban, Chris Hemsworth and all those involved in 12 Strong can be commended. Perhaps next time Ayoob throws one of his legendary parties in Queens the director, producers, and whole cast can attend in this celebration of Muslim-American friendships forged in battle and enjoy a feast fit for a king…or at least a warlord. I would like to dedicate this article to Julie Romei who has been a fereshta (guardian angel) to me and became my “hands” for writing this piece up after my own were injured in Iraq. Tashakor, thank you Julie for your guidance, inspiration and support. I would also like to dedidicate it and say tashakor to my choban (shepherd) Carol Hansen who is indispensible in my writing and all my “missions.” And third, I would like to dedicate it to Amy Nutsch, Khadija Dostum, and all the wives who sent their men to fight the terrorists. Many thanks also to legendary “Afghan hand” Robert Young Pelton.